A group of Rockford Public School students came up with an idea earlier this spring – what if we could sell lemonade and help local kids in need? That’s exactly what Isabelle and Adrienne Suidinski of Roguewood Elementary and their cousins Brady and Brooks Cronkright of Valley View Elementary and St. Peter’s Preschool respectively did this summer. The four kids started a lemonade business to help local kids in need and recently gave a local charity enough money to feed an entire classroom of children. Everything starts with an idea and this project was no exception. In early spring, Isabelle had helped friends in her neighborhood work lemonade stands and although the traffic was light, she noticed that most cars would stop and purchase something. This observation led to a conversation with her sister and cousins about starting their own lemonade stand. The kids agreed and brought the idea to their parents, Heidi and Scott Suidinski (parents of Isabelle and Adrienne) and Julie and Tom Cronkright (parents of Brady and Brooks). The project was truly a family affair. 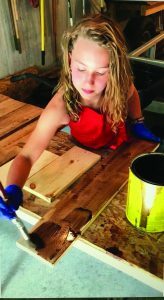 Isabelle and her father, Scott, made the lemonade stand in their garage while Brady and his mother, Julie, outlined the business plan, created the logo “Kids4Kids” and developed the merchandising plan for the stand. While the parents were traveling in Mobile, Alabama in late spring, they met an artist that made vintage aprons out of reclaimed window drapes and donated the sale proceeds back to children in need of heart devices. An immediate connection was made and a custom set of lemon-inspired aprons were delivered to Rockford just two weeks later. As with any business, location is critical and the children wanted to do something in downtown Rockford so that as many people as possible could walk by the stand. They found the perfect location on the west side of Jade along the White Pine Trail to start their venture. The Rockford community responded incredibly well to the idea of selling lemonade in effort to do something for a greater cause. “We were super excited to have our first customer come up to the stand,” said Isabelle. “It was a fun activity for us to do over the summer and I’ve always wanted to help others in need.” The local charity they supported, Hand2Hand, delivers backpack lunches to children who do not have access to stable food sources at home. The organization was incredibly grateful for the donation. “These kids are making a tangible difference in the lives of others and the fact that they would take their precious summer time to help other children is inspiring.” said Jodi Joseph, Director of New Partnerships (more at: www.hand2handbackpack.org).